The Vega Pedicure Set offers complete solution for all your pedicure needs. Vega 2 in 1 Pedicure Brush: This long lasting medium pumice stone/ brush with an ergonomically styled handle effectively removes hard rough, dry skin and calluses on hands, feet knees and elbows. Vega Large Nail Clipper: Vega Large Nail Clipper cuts even short nails safely and effectively. Whether it's a manicure-pedicure or just simple grooming Vega Large Nail Clipper is definitely the product you need. 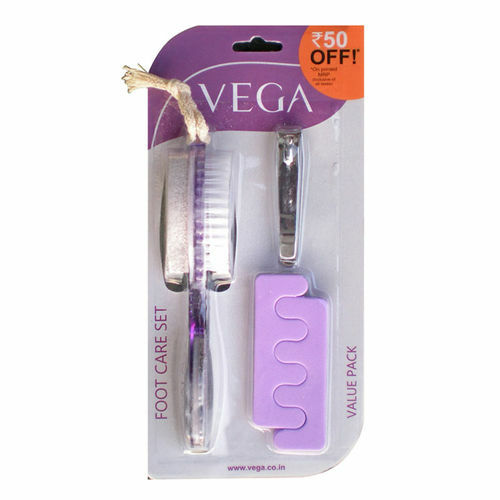 Vega Toe separators: This soft sponge toe separators make lacquer application simpler. Explore the entire range of Manicure & Pedicure Kits available on Nykaa. Shop more Vega products here.You can browse through the complete world of Vega Manicure & Pedicure Kits .